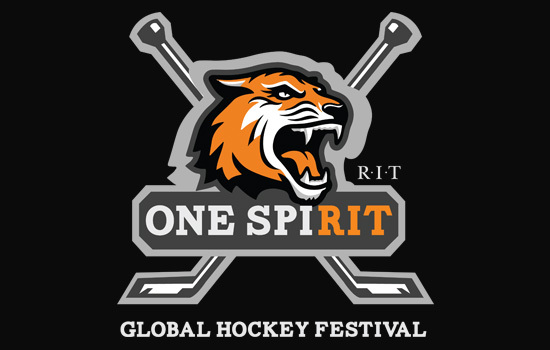 Rochester Institute of Technology, in an effort to connect its five campuses worldwide, will host its inaugural One SpiRIT: Global Hockey Festival at the brand new Gene Polisseni Center on Saturday, Oct. 11. In a global celebration of RIT hockey, RIT’s main campus will be connected with its international campuses in Croatia, Dubai and Kosovo via advanced Cisco Systems telecommunications technology. This technology will allow students from around the world to interact with each other in real time. 12:30 p.m.: festivities begin at a tent located between the Student Alumni Union and the Gene Polisseni Center. 1:30 p.m.: worldwide broadcast powered by Cisco begins on big screens at five global locations. 3:05 p.m.: women’s hockey game vs. Northeastern University. 7:05 p.m.: men’s hockey game vs. Clarkson University. James Watters, senior vice president of Finance and Administration, said the One SpiRIT festival is an outgrowth of the leadership development program that connects the student governments of RIT’s overseas campuses with the Rochester campus. The festival is free of charge and open to the public. Admission to the women’s hockey game is free for students with an RIT student ID. Tickets for the men’s and women’s games are still available. Karey Pine, senior director of the RIT Center for Campus Life, said that when festival-goers arrive, they will be in for a unique experience that features a tailgate atmosphere combined with technology and a global presence. The One SpiRIT festival is geared up for a powerful online presence. The day’s hockey games will be streamed on a special One SpiRIT website: www.rit.edu/onespirit. The event will also be represented on Twitter by #RITOneSpirit and a festival Facebook page. Cisco video conferencing technology, TelePresence, will power the event. The technology seamlessly links two different spaces with 1080p video and spatial audio. On the other side of the globe, RIT students will be celebrating at pubs, clubs and their own campuses.